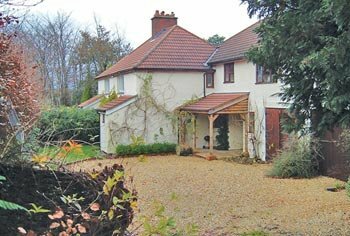 Worzel Cottage sleeps four people in two double bedrooms, there is a comfortable sitting room with a wood burning stove for those cosy winter evenings by the fire. Dogs are welcome and WiFi is available. Worzel cottage is situated on a 28 acre farm which keeps sheep, lots of horses and just the one tame chicken who may well come to visit! The delightful light, modern and airy ground floor accommodation is peaceful and quiet, you can sit out on the patio, watch and listen to the wild birds, listen for the cuckoo and watch the buzzards flying over the nearby fields or use our hide to watch the wildlife without being detected. It is a unique place where Tessa and Chris devote their attention on their one and only holiday cottage,which is set rurally just 2 miles from the special little town of Dulverton, where time sometimes seems to stand still, where you can walk on a Saturday evening with the same relaxed calmness as you would during the day. Walkers, horse riders, twitchers and mountain bikers will all have a wealth of places to explore during their stay. Exmoor has a unique landscape with heather moorland, woodlands and valleys plus the added beauty of the coast with its rugged cliffs and bays. Visit the pretty thatched villages, sample the excellent local award winning tea rooms and pubs. The Exe Valley has become famed for the fly fishing it can offer including casting for rainbow trout, wild brown trout, salmon and grayling at the Nick Hart Fly Fishing School Exebridge. There is also fishing for trout and salmon on the River Barle and River Exe. Wimbleball and Clatworthy Resevoirs are also very popular for fly fishing. What better way to explore Exmoor than on horseback. There are two riding schools closeby for both novice and experienced riders. They will be only too pleased to advise you and with over 400 miles of bridleways you will be spoilt for choice. Another popular sport is mountain biking and Exmoor has excellent cycle tracks all marked according to difficulty. We have a covered area especially for bike storage. Walkers are always welcome on Exmoor and will be spoilt for choice with its heather moorland and rugged coastline. We are lucky to have both the Coleridge Way and the South West Coastal Path not too far away.